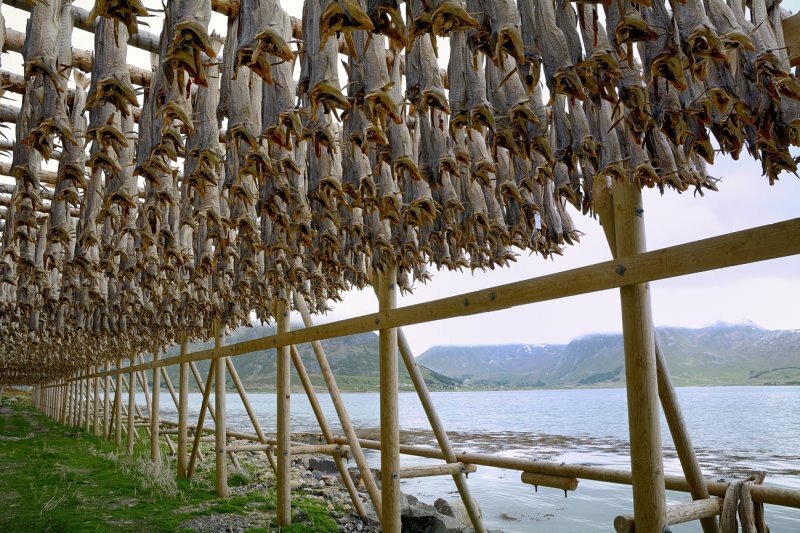 Stockfish is unsalted fish, especially cod, dried by cold air and wind on wooden racks on the foreshore. The drying of food is the world's oldest known preservation method, and dried fish has a storage life of several years. The method is cheap and effective in suitable climates. prachtig om te zien. ik ruik het zelfs. What a shot. Amazing method. Let's hope the climate stays "suitable"! Amazing shot of these racks with a superb caption Ton. Great picture, an unusual sight would not like to be there at night! An interesting commentary. I learned from it. The ro upon row of fish is detailed and well exposed. "VV"
Beautiful well composed image of this fish processing method Ton. Nice description too. Very interesting image, so nicely composed. What a neat documentary shot. Great perspective and details. Nice background too to highlight the location. Must say, not my favorite seafood. "V"
What a great capture with the myriad drying fish. My husband glanced at the picture and asked if they were bats ;-). V.
Well composed to show also the environment ! V.
salt free fish is all the more enticing...intriguing photo with several patterns to delight the eye..